Written by Mark Morris (author of "Vampire Circus"), the second of Hammer Chiller's audio plays focuses on Ian Hibbert (played by comedian Miles Jupp), a rather stubborn and fussy resident of Darwell who decides to clean up the town, persuading both his wife and a couple of like-minded neighbours to join him in clearing the trash that has become so ghastly in recent years. It is very easy to relate to Hibbert's cause, and the social issues that plague him. And it is equally easy to feel sympathy for both him and his wife Beth (Camille Coduri) as their attempts to improve the community come under constant attack and threats. Open hostility from the Darwell residents forces the group to abandon their first attempt at a clean-up operation, and it doesn't get any easier. It is clear that someone doesn't welcome their good-intentions. The over-zealous Hibbert refuses to back down, even after Malcolm's van is set alight and their other neighbour and "CUD" member Barbara Whitlow (Jacqueline King) vanishes in mysterious circumstances. Even Hibbert's own daughter Sam (played by the talented and lovely Lauren Kellegher) is attacked by a gang of hoodies while on her way home. Astonishingly, the local police - especially DS Bob Sharpe (Bailey's second role in this story) - fails to show any genuine concern for the aggression aimed at this small band of residents. There is a little of "The Wicker Man" here, a society that in general seems to know more than the minority and keeps many secrets. As with Hammer Chiller's first tale, The Box, production is high once more, with perfect sound design and music. The casting is simply superb with Jupp, Coduri, Bailey, King and Kellegher working well together. Danny Horn, too, delivers his part well as the Hoodie; Doctor Who fans will of course remember Horn as a young Kazran from 2010's "A Christmas Carol". 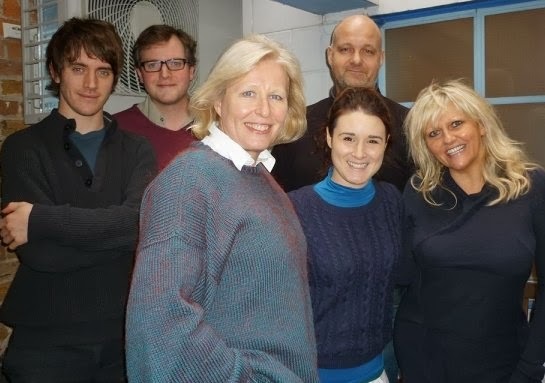 Another cast member who is no stranger to BBC One's flagship sci-fi show is Coduri, who portrayed the role of Jackie Tyler, mother to Billie Piper's Rose. And, if you are not familiar with actress Lauren Kellegher then how about familiarising yourself with Bafflegab's Vince Cosmos, the story of young girl Poppy Munday whose life is changed forever after meeting glam rocker Cosmos. In addition, Kellegher stars in "The Devil In Darkness" (the fifth installment of Hammer Chillers), and various film and theatre work. As said in my last review, good things are quite clearly originating from a partnership between Hammer Films and Bafflegab, and long may this collaboration continue. With the best talent involved, there is nowhere this project cannot go, from haunted helicopter escape simulators to Greek myth - and beyond... One half-hour tale from the first anthology of Hammer Chillers released per week, which began with "The Box" on 7th June 2013 and completes on 12th July 2013 with Stephen Volk's "Don't Go There". They are also available as a CD digipack, all purchasable from the official website. Mention must be given to Simon Barnard, who produced and directed the collection, with post production by Martin Johnson. The excellently creepy music was composed by Edwin Sykes, and design by Mark Plastow (a web designer who has even worked his magic on several Big Finish products). And let us not forget Sam Smith's fabulous artwork for the series!